Ruby is a variety of the gems species corundum. 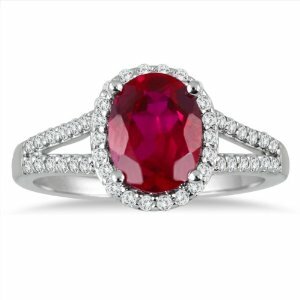 It is harder than any natural gemstone except diamond, which means a ruby is durable enough for everyday wear. Fine-quality ruby is extremely rare, and the color of the gem is most important to its value. The most prized color is a medium or medium dark vivid red or slightly purplish red. The first information about the July Birthstone is found in the ancient Indian traditions, dating from the VI century BC. Ruby got its name from the Latin word rubella – red. In the scriptures it is called the «king of gems», «leader of the gems» – it was thought that the owner of the July Birthstone ruby guaranteed full safety, even among enemies. NYC Wholesale Diamonds features a magnificent line of Ruby and Diamond Jewelry. Highlights include Engagement Rings, Tennis Bracelets, Earrings, Necklaces and Wedding Bands.